Sourav Sirs classes is a place where we help students in preparing for Economics, Mathematics in honors level. ISI entrance in B.Stat, B.Math, Economics entrance in ISI MSGE, DSE, IGIDR, DSE, MSE, JU, CU, presidency uni actuarial Science examinations like ACET, CT level, CPT classes B.Com classes for all universities, CAT, MAT, XAT tuition. Job related courses like banking, clerical, IBPS can have back up classes, study material, free demo classes. 37 out of 40 students cracked Actuarial Science ACET examination. Classroom Training For Actuarial Science. Question:What is the importance of Current Affairs for ACET examination? according to new pattern there is no0 section of current affairs in acet exam . Question:What is the syllabus for 2016 ACET examination? Question:Which course is appropriate to pursue along with GATE? Question:When to start preparing for GATE exams? This is an amazing institute for Economics. I cracked my ACET examination very well. I am highly thankful to Sourav sirs classes for the help and support. Classes are very good, model exam papers are very useful, almost everything comes commonly in the exam. Very useful classes. The process of teaching is innovative . The study materials are very effective for exam purpose. I am taking classes. Its been a good experience so far as Sir is co-operative.He gives students a priority rather than the marks and teaches in different ways to make us understand. Things were different before I joined Sourav Sir's Classes.I could not solve mathematical problems that easy.Now I can and am confident about other subjects because of the positive energy passed over to me from Sir. I am very happy to let the readers' know that my son has got himself enrolled in a government college for engineering degree following a year of guidance of good teachers in Sourav Sir's Classes. Thank you. Sir is an amazing teacher. He teaches really well. He has a unique way of teaching. He is also very knowledgeable teacher. Sourav Sir's Classes have been most helpful for helping me out from a critical situation.It is only because of sir that I have been able to get good marks in 2nd-year economics examination. Sourav Sir's Classes is one of the best Coaching institutes in kolkata for java and J2ee. Sourab sir concept about java is very clear. I have learned many things from him. Sir teaches Mathematics in a way one is bound to understand. Sir relates Mathematics with daily life so easily that you won't forget the particular Mathematics equation for the lifetime. Now I am into teaching as well and know how good he is as a teacher. The easy method of teaching has helped me understand Mathematics better. I have grown confidence in Mathematics and I am scoring better marks now. Sir has been very helpful from the beginning. He was the one who helped me score good marks in Mathematics and Statistics. For him, I have grown confidence in these subjects and is also preparing for ISI under his guidance. I have just started classes for Economics. It has been very good. The classes are very helpful. I have improved in some months and am hoping will score good marks in my 1st semester. I have been into Sourav sir's classes for MBA examinations and it helped me a lot. I cracked the examination and am now working in an MNC. Thank You Sourav Sir. Sourav Sir is a great tutor. He helped me a lot in the preparation of MBA. For him, I could crack CAT and get into a good B-school. 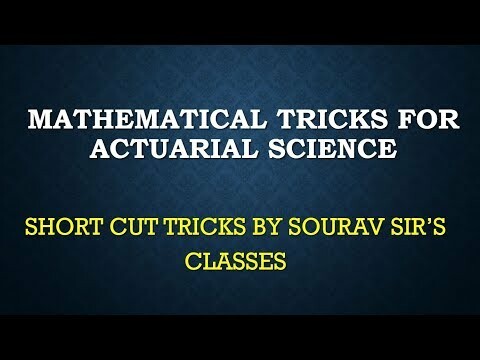 I came to sourav sirs classes for mathematics tuition of actuarial science exam tuition and presently i'm taking ct classes. He has helped me to pass acet and I hope I will do good in ct level also. After taking sir's Mathematics classes, I have cleared my Mathematics examination with ease. I am also taking Actuarial science classes from him and he is helping me a lot and I am sure that I will be to crack this examination as well. I have taken classes from Sourav sir. Each class was very helpful and I am completely satisfied. Best faculty in Actuarial science. Glad to be a part of this class. It was a magnificent course conveyed by an unprecedented man. Yes, I really appreciate your inside and out information, methodology and thoughts. I took tuition from Sourav Sir for Bsc. I took classes for statistics from sir. He is an amazing teacher. I got 70% for Sir only. He put a lot of effort for which I scored well. I benefitted a lot. I cleared ACET and CT 3, 5, 6 examinations under Sourav sir's classes. The ambience is good, he took many extra classes, and I am very much satisfied with the way he has taught me. I would highly recommend him to others. I started taking Mathematics Classes from Sir around four months back. After some classes, I gained my confidence back and when exams came he just have made me so confident that I answered all the questions. I really gained a lot of confidence in Mathematics, I am really grateful to you for all the help. A very good and well-designed class structure. All the exams and the suggestions helped me a lot. I am also very satisfied with the way of Sourav Sir's teaching. I am highly recommending him. The way sir's classes are conducted is very well. I loved the style of his teaching very much. In each and every class, he gave special care to all the students. As I was a weak student and already changed many tuitions, I got some really positive signs here. I am highly recommending his classes. I took Mathematics tuition from for competitive level. He is a nice tutor. The classes were really good.